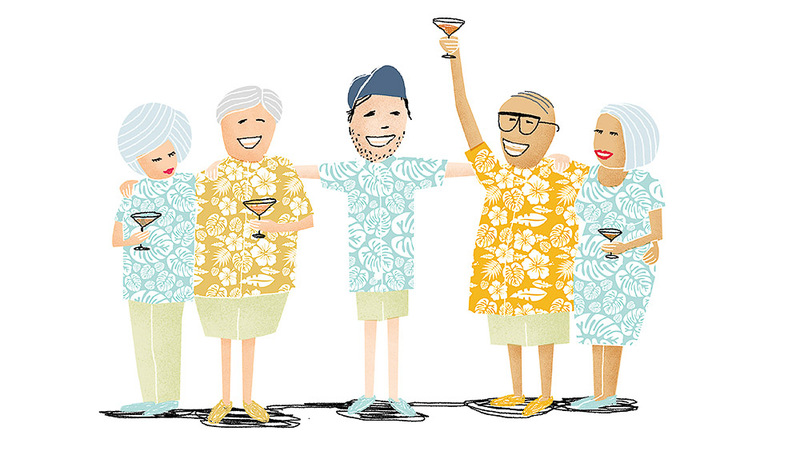 What happens when a Gen-Xer wanders onto to a baby boomer cruise? (illustration: Mike Rossi). What happen when a Gen X-er accidentally stumbles onto an all baby boomer cruise. stumble onto a Steve Madgwick discovers that being the youngest traveller on a group inter-gen cruise offers up familial camaraderie rather than septuagenarian solitude. I can’t remember the exact moment I was adopted. I didn’t sign any paperwork, nor was there ceremony or fanfare. And, because my birth parents are still very much alive, and I actually quite like them, I’m pretty sure it might have broken a handful of laws and could have me disowned one day too. It started as a blatant act of pity; a mercy-adoption, if you will. I was a wretched sight; nervously twitching, not sure where to sit or which way to look. Utterly alone at a ‘spare’ table, I quaffed all the all-inclusive Portuguese wine I could quaff, in the hope that Dutch courage would somehow launch me onto one of the cool tables. I was flying solo, on assignment for Australian Traveller’s sister title, International Traveller, and theoretically I should have been in my element. It was my first ever cruise, along Portugal’s mesmerising Douro Valley, the only place in the world where you can make port and legally call it that. Not a bad way to break my cruise cherry, right? Yes, indeed, but a couple of ‘complications’ soon bobbed up, both of them distinctly mathematical in nature. You see, I am somewhere in my, ahem, forties. Let’s call it youngish forties, at least in body; although my mental age is akin to an immature 20-something drifter’s. Looking across the dining room of the long, low-slung luxury riverboat on the first day, there was a sky of grey-haired clouds on my sun-shiny horizon. I guessed the average age of my fellow passengers to be 74.6 years old. Not quite ‘Fairstar the fun ship’ then. The second mathematical anomaly related to even numbers: apparently cruise people like to cruise in pairs. Not one table of odd numbers. Not one. Not that I was looking for a sugar-momma hook-up or anything of that salacious nature, but this perfectly matched human equation rendered me the perpetual third wheel (or slightly less-worn tyre, as it were) for a week. During the daytime, this would be no problem, with plenty of side trips where I could sheathe my solitude amongst the crowd. Only during set meal times would this little lost lamb have to come out to graze solo. At that first dinner, I scoffed down three sensational courses in stroppy silence, pretending to be doing something really, really important on my phone, even though the boat was navigating a reception-stifling gorge. After the cheese plate, I skulked off to the luxurious isolation of my stateroom. On the second night, ‘it’ happened: I saw ‘them’ as soon as I entered the dining room. Or perhaps they saw me first. Through swerving waiters and shuffling diners, a weird warm halo settled on the table of six beckoning countenances. At the table’s head, an empty chair, as if reserved for a long-lost comrade. I shuffled my way across the room, where this squeaky seventh wheel screeched to a halt. “Take a seat young man,” was the ice-breaker. It was not quite an instantaneous thaw. While there was no language barrier (except for my lazy Australian English), our cultural contrasts and gaping variances in vintages initially shackled the chat. But over the following week, I listened to and learned from more than 400 collective years of wisdom. My interesting and interested new family, from California, connected through one, quite specific, shared interest: the mens’ passion for duck hunting. Every morning, the in-jokes would begin where they had left off the night before; like a family Christmas, less the feuding and angst. We bantered about the rhythms and vicissitudes of Californian life while they took an interest in whatever was on my mind. And so it grew. Throughout the day, when we crossed paths on our separate excursions to vineyards and through UNESCO-protected towns, they would make a big fuss. “Steve, see you tonight!” they would bellow, their smiles colossal and familial. On night six, they even flocked together to save me from what could have been a very serious incident. During one post-dinner ‘lounge session’, an amorous cocktail-fuelled woman (around 70) thought she would hone her flirting routine on the clearly vulnerable baby of the group. My inseparable family unit swooped as one protective wing against this marauder. Family crisis averted, we stuck together that night, downing the poisons of choice together, and taking turns to ruin Rod Stewart and Billy Joel songs at the top of our lungs long into the night (well, we made it to 10.30pm). A glassy-eyed melancholy sat at the table with us on the final night’s captain’s dinner. Contacts were swapped, earnest invites of “you have to visit” shot back and forth. But something had changed and it was clear my three new mothers and three new fathers, all grandmothers and grandfathers themselves, knew the feeling all too well. This awkward little duck was leaving the pond and heading back into the big, wide world.